Prior to setting out on the Friendship Arabia Tour, I applied for my Macedonian visa at their mission in Doha, Qatar. When the Macedonian Ambassador heard of the reason for my visit, he went out of his way to make me feel welcome, sending a car to my hotel in Doha to pick me up, gave me the visa, and asked his driver to drop me back. I was touched and impressed that he would do so much to promote his country. When I arrived in the Macedonian capital Skopje today, I made it a point to call the Ambassador, who promptly arranged for me to meet the Minister for Foreign Investment Gligor Tashkovich. Despite the short notice, the minister welcomed me to his office and spoke highly about the good relations that Macedonia has with the Gulf countries, and was happy that the Friendship Tour included a stop in his country. He himself has been to the Arabian Gulf and talked about the importance of tourism investment. 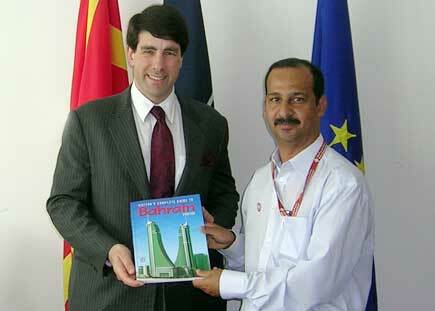 I thanked him for his hospitality and presented him with a copy of the Visitor's Complete Guide to Bahrain. The minister showed great interest, especially in the guide's business section. After leaving his office and enjoying a lovely lunch at a restaurant, I went to a bookstore and signed a deal to sell the Friendship Arabia book that is being published after the tour. The book will have a special section on Macedonia. 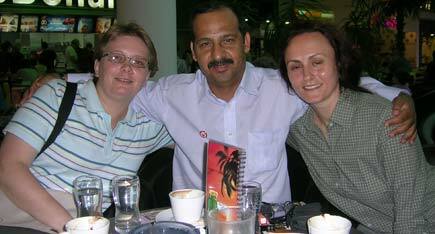 After that, I met up with Renata and Annette, who I met two years ago on an adventure trip to Yemen, gave them copies of the Bahrain guide as well, and then drove back to my hotel in Bitola. I must say I am fortunate to have two phones with me on this trip: My Batelco phone didn't have roaming facilities within Macedonia, but thankfully my Zain line worked perfectly and kept me connected to the world. (An extra large thanks to Zain! ).